loads of different types of noodles! Oh of course…Chinese New Year!! and contributes to my 5-10 a day is… a stir fry. 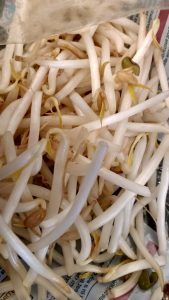 The noodles I like to use in my stir fry are bean sprouts which are made from sprouted mung beans. I prefer them as they are crisp and slightly nutty tasting…and of course high in more nutrients than the softer noodles (which are usually made with white rice or wheat flour). So great if you are watching your calories or carb intake. Half a bag (140 grams) is only 65 kcal and 2.9 grams of carbs. Brilliant if you want to increase your fibre content (and most of us should as we don’t want our estrogen hormones recirculating around our body). 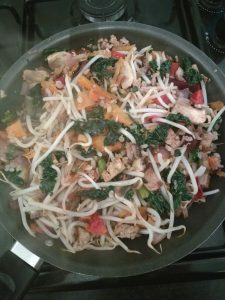 We should aim for 35g of fibre a day…half a bag of beansprouts contain 2.5g and including all the other lovely veg in your stir fry will increase fibre content of your stir fry to a lovely healthy amount. Fantastic if you want to boost your B vitamins – especially needed if you are feeling a bit low on energy. Fabulous if you need to get a boost of vitamin C – and you probably do if you’re immune system needs a boost. But not only the immune system but Vitamin C also helps with absorption of iron in our diet (and if you’re suffering with heavy periods you need all the help you can get to keep iron levels optimum); and it is necessary for collagen production so thinking of our musculoskeletal health and our skin (sorry ladies…but something else that declines in peri-menopausal years is collagen). Marvelous (I’m running out of adjectives to use here!!) if you would like a dose of vitamin K – as well as blood clotting vitamin K also helps regulate blood calcium levels. 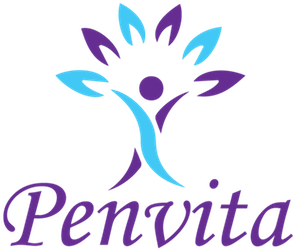 So definitely needed for protection against osteoporosis as we move towards our peri-menopause years. also using up ingredients in the fridge. A very simple and easy…some may say boring recipe. So what else can you add or swap? Use different spices such as chilli, ginger root, lemon grass, 5-spice and soy sauce or tamari which is lower in sodium. For protein in the meal add cooked chicken, prawns, fish or cashew nuts, fermented soy beans – natto or tempeh. As for veg…well the world is your oyster…or veg market!! Mange tout, cabbage, broccoli, red/green/yellow bell peppers, baby sweetcorn, mushrooms…we could fill a page (or rather a wok!!). One thing to remember is the different time the type of vegetable needs to cook. 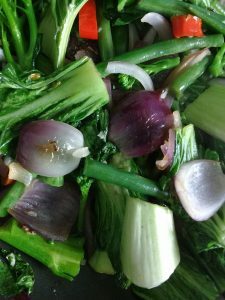 You don’t want to cook the death out of the veg as you’ll lose the nutrient content; some things like carrots for example if left quite big will need longer. I shave my carrots…that sounds funny, they’re not hairy …just use a potato peeler repeatedly over the carrot so they don’t take so long to cook. So go and experiment and let me know what worked for you.